We have a whole slew of shows across Finland this August slated with FCF Wrestling, and I am stoked about this! The fact that FCF runs more events on an annual basis than 3/4 of our contemporaries out there in Europe puts us at the top of the food chain in the pro wrestling field on our continent. 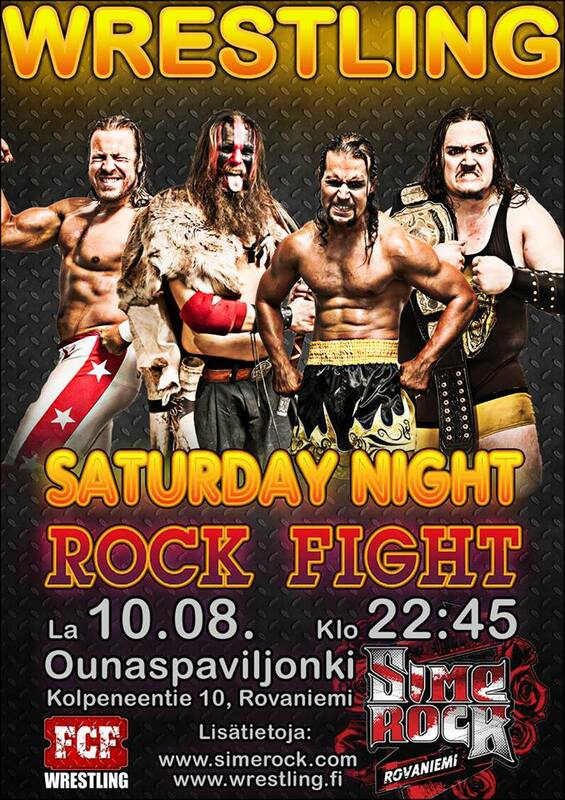 On August 10 in Rovaniemi, Finland, FCF Wrestling presents Saturday Night Rock Fight at the 2013 installment of the Simerock Festival. This is a special occasion, as the wrestling will be in the main slot of Saturday’s Simerock line-up, starting at 22:45 with five big matches on the menu. Saturday Night Rock Fight will be headlined by Yours Truly tagging with “Wildman” Heimo Ukonselkä against Stark Adder and FCF champion King Kong Karhula. 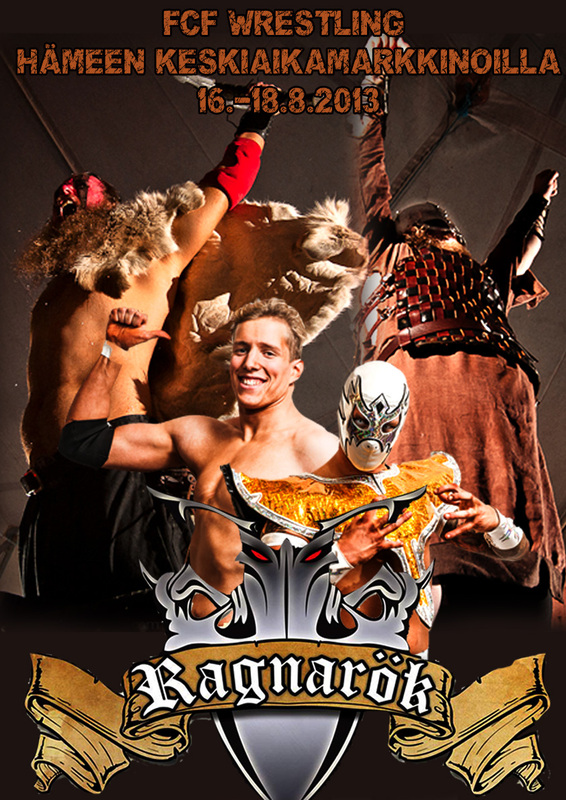 Between August 16-18, FCF Wrestling will present Ragnarök 2013 at this year’s Häme Medeival Fair in Hämeenlinna, Finland. This theme weekend, featuring reenactments and relics of the Medeival era in Nordic culture, is an annual attraction in the city of Hämeenlinna. 2013 marks the third year that FCF Wrestling has been a part of the festivities and program. All throughout the three days, Friday to Sunday, wrestling matches will be held in a central tent on the fair grounds, three times a day. The gimmick is that all the wrestlers must dress up in Medeival costumes and garb for their matches, adding to the flair and flavor of the whole kit and caboodle. For more infos, go to the Medeival Fair website. 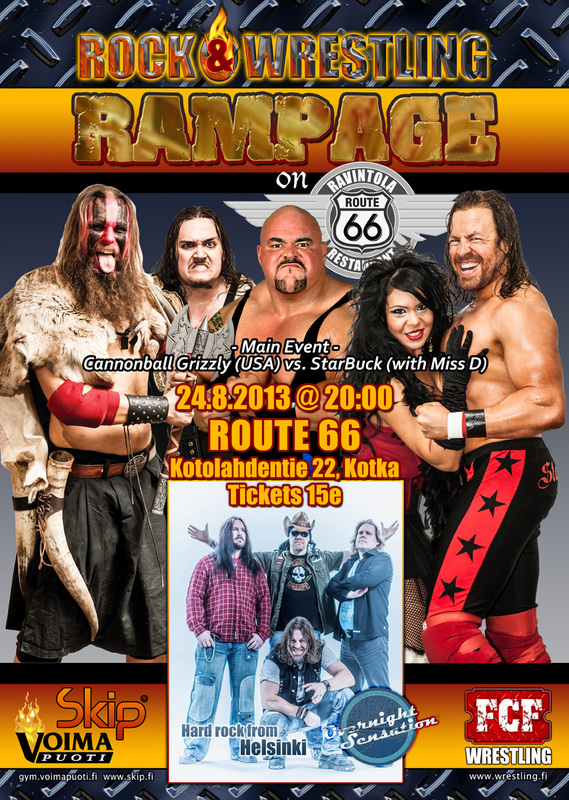 On August 24, FCF Wrestling comes to Kotka, Finland for an event entitled Rock & Wrestling Rampage at Route 66. The catch here is, that the show is restricted to anyone under the age of 18, with alcohol and strippers on hand also. This big event will feature five kickass wrestling matches, headlined by 185kg/188cm Cannonball Grizzly from the USA challenging me for my BWA (British Wrestling Alliance) Catchweight championship title. This is going to be undoubtedly my toughest challenge to date, as Grizzly is a 25-year veteran of the ring wars, and the current reigning EWP (European Wrestling Promotion) heavyweight champion in Germany. Grizzly has wrestled in 40 countries worldwide over his extensive career, and on August 24 he adds Finland to that list. I just have to hope that I find a way by hook or by crook to retain my BWA championship at Rock & Wrestling Rampage, because I have never wrestled against anyone the size of Cannonball Grizzly before, and my active in-ring career dates all the way back to 1994! In addition, my hard rock band Overnight Sensation will be playing live in Kotka at the same event, offering up originals and known cover songs by acclaimed artists such as The Cult, Van Halen, Ted Nugent, Motörhead and Thin Lizzy.